Partners from across Coventry have launched the Coventry Domestic Abuse Strategy 2018-2023 to tackle domestic abuse in the city. The strategy will take a long-term preventative approach to tackling domestic abuse, including honour-based violence and forced marriage. and facilitating behaviour change in perpetrators, whilst also ensuring that they are held accountable for their actions. Domestic abuse can affect anyone regardless of age, gender, ethnicity or sexual orientation, although women and children carry the greatest burden. The rate of domestic abuse is higher in Coventry than the national average. Between April 2016 and July 2017 there were more than 2700 domestic abuse incidents recorded by West Midlands Police in Coventry. The consequences of domestic abuse are devastating. It is associated with an increased risk of mental and physical health problems; and children exposed to domestic abuse are at an increased risk of becoming a victim or perpetrator themselves. 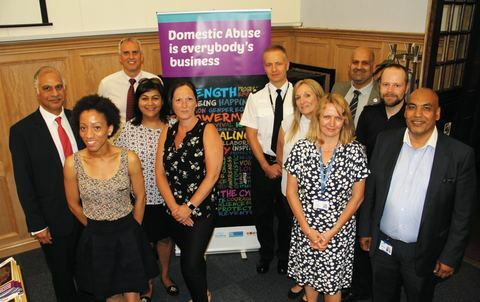 Cllr Pervez Akhtar, Deputy Cabinet Member for Policing and Equalities said: “Domestic abuse in all its forms is an issue which needs our attention – we all have to play a part in tackling not just the crimes themselves, but the root causes. “Across England, almost two million people experienced domestic abuse in 2016-17. The Coventry Domestic Violence and Abuse Partnership, made up of Refuge, Barnardo’s, Valley House, Panahghar and Fry Housing, provides services for victims and perpetrators of domestic abuse in Coventry. Coventry Haven supports women and children experiencing domestic abuse. Individuals of Black, Asian, Minority Ethnic and Refugee background; adults with care and support needs including disabled people; older people; men; and those who identify as lesbian, gay, bisexual or transgender can face additional barriers to accessing support services. The priorities of the strategy have been informed by consultation with a wide range of partners including users and providers of domestic abuse services, voluntary and community sector organisations, West Midlands Police, Coventry and Rugby CCG, and colleagues from health and social care, and education. You can find a video, specially crafted for the launch, on the Coventry City Council YouTube channel. For further information about how to access domestic abuse services in Coventry please visit Safe To Talk and Coventry Haven.